Did Sears, Roebuck Sell Homes in Canada? Were Sears homes sold in Canada? "The largest American company involved in the business, Sears, did not sell catalogue houses in Canada." "There are no records indicating that Sears ever marketed Modern Homes in Canada." Sears never mentioned sales to Canada in any of the Modern Homes catalogs. However, it would be straightforward for Sears to ship a kit home by railroad to Canada from their mill in Cairo, Illinois. We do know that Sears shipped homes to Alaska, so shipping homes to Canada would be just as easy. In that era, there was a tariff on building materials shipped from the United States, so that is one reason we don't find many Sears houses in Canada. There is an authenticated Sears Columbine in Edmonton. 11146 66 St. NW, Edmonton, Alberta. Photo courtesy of Allie Korpesio. 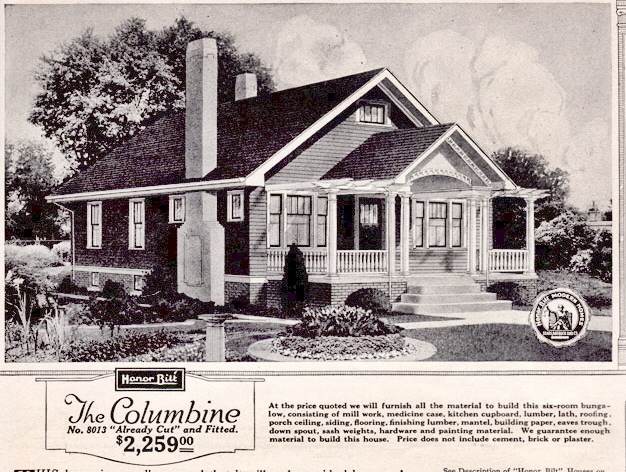 The Columbine had an optional second floor, which this house does not have. The porch is enclosed and the pergolas have been removed. There is no fireplace (a common cost-savings decision). There is an addition off the back. The stucco exterior is not original to the house. The Columbine in Edmonton was built in 1928 by a local builder, George Francis Jeffrey. The first occupants were John and Hilda Gallagher who purchased the home in 1930 and lived there for more than 20 years. The current homeowner located the original building permit and under the heading "Plans" was "SR" for Sears, Roebuck. Well my great grandfather was a blacksmith in Nova Scotia and he told us he ordered a home kit from Sears around 1910 and it looks just like The Silverdale from the layout. It did come by rail as well!